Fall is one of my favorite seasons and apples are a big part of it – apple picking, apple pie and of course, apple cider donuts. If you go during the weekends, Wilson Farm has frying station right outside. You can watch as your donut goes from the fryer, into the cinnamon sugar, on its way to your mouth. Delicious. Sadly, when I stopped by today, they only had them in pre-packed half dozens. 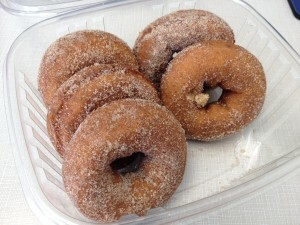 The woman stacking the display assured me that the donuts were freshly fried in their bakery, so I grabbed a box ($3). As you can see from my picture, I gobbled one down before I remembered to take the photo. The donut was dense and cake like, sweet and cinnamon-y. They are better fresh from the fryer, but these were still great.